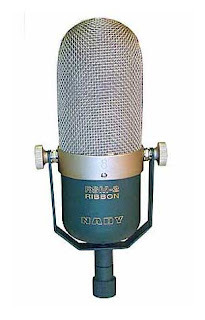 Prior to the appearance of the Nady RSM-2, ribbon mic choices tended to be American or European with street prices starting at $600 and up. How good is the RSM-2? The answer, in my opinion, is good. I have used this mic on a variety of sources, and the results were almost always usable and in many cases excellent. In addition, it compared very favorably to a popular and more expensive ribbon, the Royer R-121. When I first received the mic, I put it to work immediately in an overdub session with Kris Doty, a female singer-songwriter. Upon pulling it out of the box, I was struck with its stunning good looks. It's huge, and it sort of looks expensive. I first tried it on my cheapish glockenspiel, where I suspected it could tame the metallic high end. It did. Furthermore, I would say that the Nady is the best mic I've ever used on glockenspiel. I usually need to apply some fairly radical EQ and compression to "glock" tracks, but these tracks required no processing and sounded great. Next, I used the Nady to mic my Fender Princeton amplifier, which I was using for a distorted, bowed string bass part. It did a superb job. The track sounded a touch dark, but that's what we were going for. Some sources it did not work so well on in this session were vocals, where it was a little too flabby in the low end and dull in the high end. After that session I was fairly pleased with the sound of the Nady. However, because I was fairly inexperienced with ribbon mics, I had no framework within which to judge its relative quality. So, I contacted Todd Harper, a local project studio owner, who agreed to help me with an A/B comparison between the Nady and the Royer 121. We both went into this comparison with the idea that any comparison between a $200 mic and a $1,000 mic would be inherently unfair, but that we would try to take that into account when evaluating the Nady. Little did we know that, not only was this comparison fair, there were some tracks where one or both of us ended up preferring the Nady over the Royer. We did the comparison at Todd's studio, West Wing Audio, which has a Radar system (great AD/DA) and several quality preamps, including the Great River MP-2NV we used for these tests. We tried to match placement and preamp settings as closely as possible between the two mics. We also tried, whenever possible, to use both mics simultaneously to record the same performance to eliminate that as a factor when evaluating the tracks. We have to admit that this testing is a little incomplete, since we were unable to record any brass, woodwind, or strings in time for this review to be written. However, if we end up doing further tests, I will update this review. We began our tests with close mic'd guitar amp, an application that the Royer is quickly becoming ubiquitous in. In my opinion, the Royer clearly beat the Nady in this application. Todd felt that either track was equally acceptable and that choosing between them was simply a matter of taste. In either case, the Royer had a mid-range "bite" that the Nady just did not have, while the Nady had a bigger bottom that that Royer did not. On male vocals, the Nady had more body and air than the Royer, which sounded boxy, nasaly, and a little lo-fi. On tambourine, the Nady sounded open and present, while the Royer again sounded boxy and a little lo-fi. We did another recording of glockenspiel, and the Royer and Nady were both excellent, though, in my opinion, the Nady edged out the Royer by just a little bit. On acoustic guitar, the Nady and the Royer each had their strengths and weaknesses, with the Royer's mid-range "bite" being particularly flattering on picked notes and the Nady's airier top end sounding quite nice on strummed parts. At the end of these tests, Todd and I were quite surprised to see how well the Nady compared to a mic that was five times its price. There was no clear winner in this comparison, and we fully expected there to be. Because of this, I can only come to the conclusion that the Nady RSM-2 is a microphone that deserves a place of solid respect in the ribbon world. At this price, this mic should be in everyone's mic locker, from the lowliest home studio to the million dollar room with the SSL. Bottom line: A budget choice that exceeds expectations. Recommended.